Besides of coarse, the selection of 25 different wood choices, what separates our beds from others is the methods we use to build and secure them together. Because we build them just one at a time, we don't need to find ways to make 100 posts fit onto 50 headboards without any custom work or fitting. We still "hand fit" each post to head & foot boards, each side rail to each post. 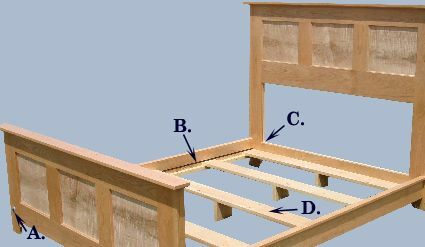 Below, please find an image and description of our sturdy bed system. 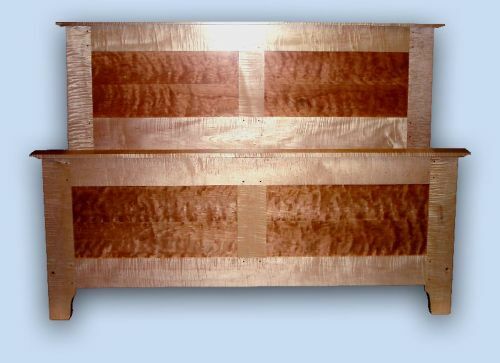 This King size custom Shaker platform bed was carefully built of the finest tiger maple and flame cherry we have ever seen. One beautiful cherry plank measuring 12' long x 10" wide was enough to book match the four panels of this bed. It is very rare to find the figure of one board this long to have such uniform figuring! To enjoy a larger view of this lovely wood selection, just click on this image. The frames forming the head and foot boards were pegged with 3/8" square walnut pegs. We hand fit each side rail into its own post. We cut a dado along the entire length of the side rails that allow "full length" bolts (made by us in our blacksmith shop) to run from foot to head board. The full length bolt is slid into a hole in the foot board (A.) then runs along the groove (B.) and through to the back side of the head board (C.) where there are threads that we place a washer and nut onto. It tightens to secure the head and foot boards more firmly than any bed you will ever find. 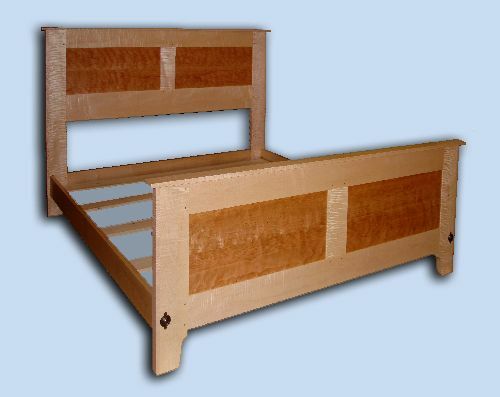 The bed slats (D.) are built of solid wood with supports that go to the floor. The bed slats are also screwed into the support boards on the side rails.